A piece of a flag Lord Admiral Nelson hoisted on HMS Victory at the Battle of Trafalgar has been sold for £8,000. The battle ensign was later draped over the naval leader's coffin following his death in the course of defeating the Franco-Spanish fleet in 1805. The 1.5ins by 2.5 ins (3.8cm by 6.3cm) piece of flag was picked up by Rowden Holdsworth at Nelson's funeral in 1806. It stayed in his family until Thursday, when it went under the hammer at Penzance Auction House in Cornwall. The fragment of the flag is pinned above a sworn declaration of its provenance made by Mr Holdsworth. 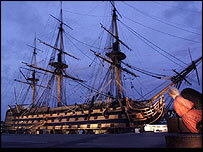 The declaration reads: "The above morceau is a part of the identical flag of HMS Victory, borne in the procession by part of the crew, with which The Hero fought, conquered and died, in the ever-memorable engagement with the Combined Fleets of France and Spain, off Cape Trafalgar on the twenty first day of October, one thousand eight hundred and five." Auctioneer David Lay said he was pleased with the sale price of £8,000 plus buyer's premium because it was difficult to put a price on the lot. He added: "Before the sale, we hadn't been able to work out whether it was going to sell or not, and it did."